The energy sector is shaping up to deal with the rapid decline in oil prices. It looks like the rapid decline in the price of oil is beginning to take its toll. Today Shell announced it would be slashing $15bn (£9.9bn) worth of investment over the next three years as it tries to mitigate the impact. The announcement came alongside the news that Shell’s profits for the fourth quarter of 2014 were down from $5.85bn in the previous quarter to $3.26bn, missing analysts’ estimates of $4.1bn. There could be more cuts to come though – ‘Shell has options to further reduce spending, but we are not over-reacting to current low oil prices and keeping our best opportunities on the table,’ it said in a statement. It’s not clear if or how many jobs could be affected, but thousands of workers in the oil and gas sector at large are thought to be at risk as drillers brace themselves for a long-term price slump. Despite dialing down this investment, Shell has vowed to press on with controversial plans to drill for oil in the Arctic. It was forced to halt operations there when a drilling rig ran aground but asked regulators for approval to start up again last year. Environmentalists are, predictably, up in arms. That’s probably not the reason but investors certainly aren’t happy with Shell this morning. Shares were down 4.25% to 2,152p this morning. 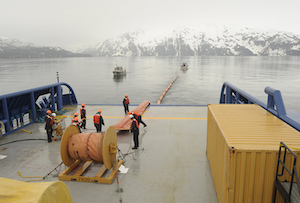 What is for sure though is that Shell will need to tread carefully if it continues to search for Arctic oil. After BP’s Deepwater Horizon PR shitstorm, the image of an oil-soaked polar bear or icebergs stained black with crude are something the oil giant will be keen to avoid.